Does your forearm or elbow hurt when you play tennis or golf? Do you suffer with cubital tunnel syndrome of the ulnar nerve around the elbow? The neobracex elbow support brace is the right answer to protect the forearm, ulnar nerve and ligaments around the elbow. Ulnar nerve brace Provides pain relief and support for the ulnar nerve and cubital tunnel syndrome. The ulnar brace supports compression of the ulnar and median nerves so you can play tennis or a round of golf without the pain we know as tennis elbow or golfers elbow. 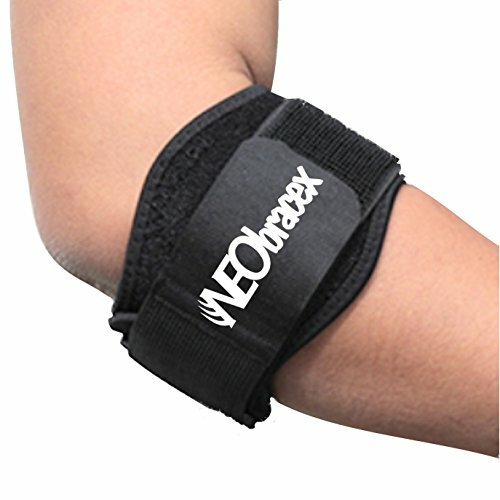 Instant elbow pain relief The neobracex tennis elbow brace can used similar to the trigger point therapy to help with pain associated with tennis elbow syndrome, golfer's elbow, fishing elbow, weightlifting elbow. It has a premium quality flexible construction designed to be worn directly over the forearm. It absorbs stress to the elbow when hitting backhands in tennis, golf, playing basketball, fishing, racquetball, cross fit and other sports. Light and comfortable The elbow brace fits perfectly thanks to its adjustment system. It is fully adjustable and fits comfortably almost everyone, kids and adult athletes love it because it can be put on and taken off in a snap. The Velcro closures provide strong fastening and easy adjustment. To use, wrap the elbow brace around the forearm just before the elbow. Fasten each Velcro to a comfortable fit. To clean, hand wash in cold water with mild detergent. Please consult a physician before usage if you are allergic to neoprene. If rash or pain develops, discontinue use and consult a physician Click the add to cart button and begin feeling the difference on your elbow and forearm with the neobracex elbow brace. If you have any questions about this product by NEObracex, contact us by completing and submitting the form below. If you are looking for a specif part number, please include it with your message.